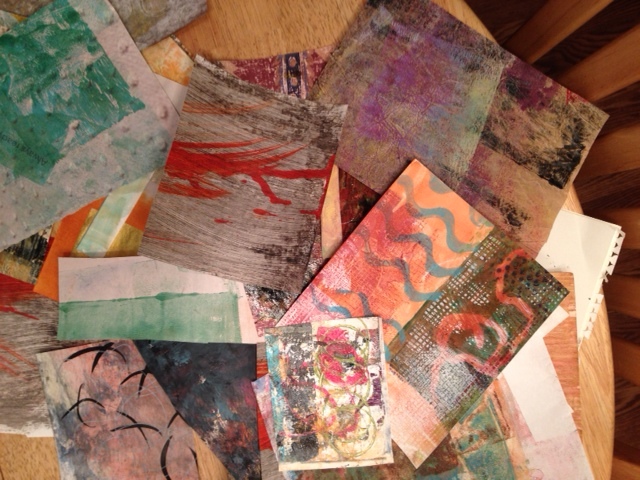 I am having so much fun with my current stash of hand painted and doodled and printed papers. 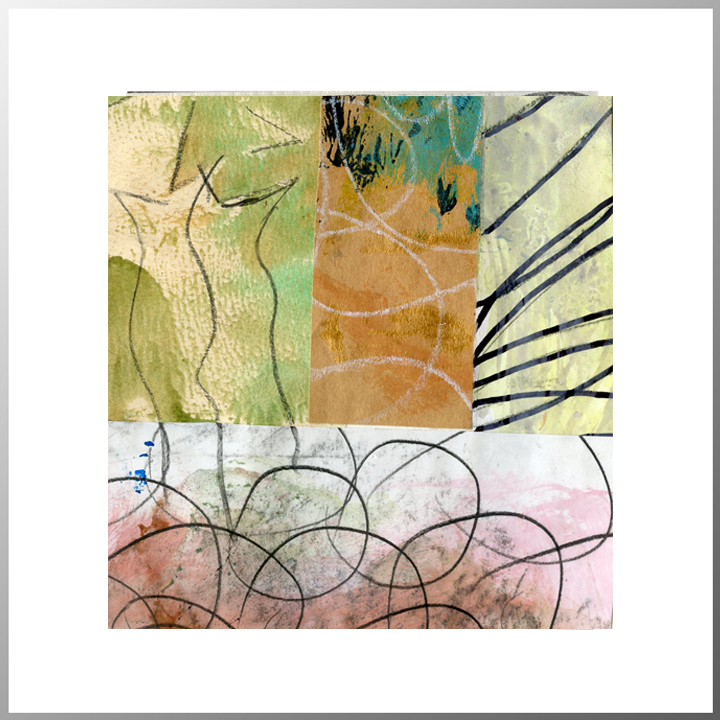 This new collage is one example of the fun. 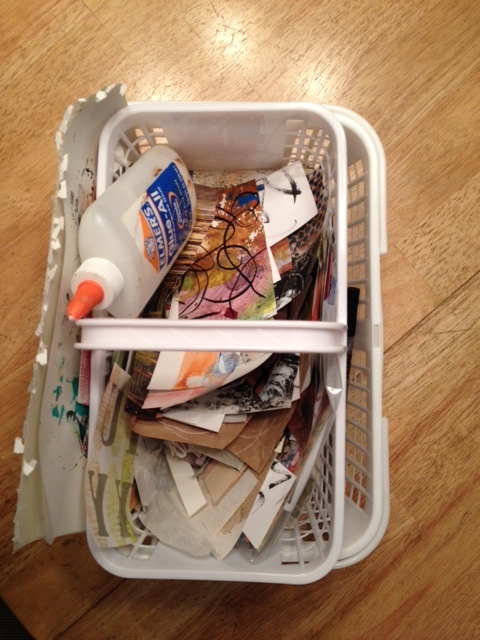 My Collage to Go basket has evolved into my go-to stash for instant collage gratification. In it I keep my current favorite papers, large and small sizes, and I find that this keeps me and my creative process more focused. Otherwise, I’m standing in the middle of my studio wondering what bag or tub or drawer to open next. Here’s a new shot of my Collage to Go basket, which is now a small basket inside a larger one. The larger one happened so I could accommodate some of the larger sheets of paper, and to keep my supplies and tools handy. The smaller basket is now mostly just for my smaller-sized papers. Here is a peek at the larger basket. Here is a look at an assortment of the larger papers from the bottom basket. And next are some of the smaller ones. I like to choose painted papers (either found or created) and doodle on top of them with various pens and pencils. 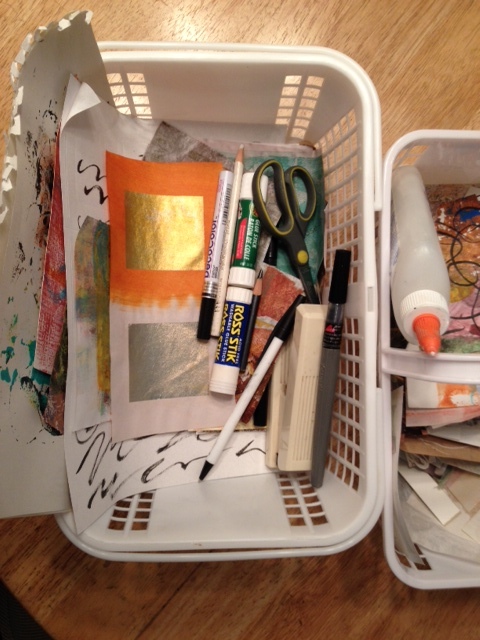 After creating the doodles and lines on larger paper, I cut it down to size to go into the small basket. Notice the brown paper with white chalk scribbles? That one is an example of how simple things can be. 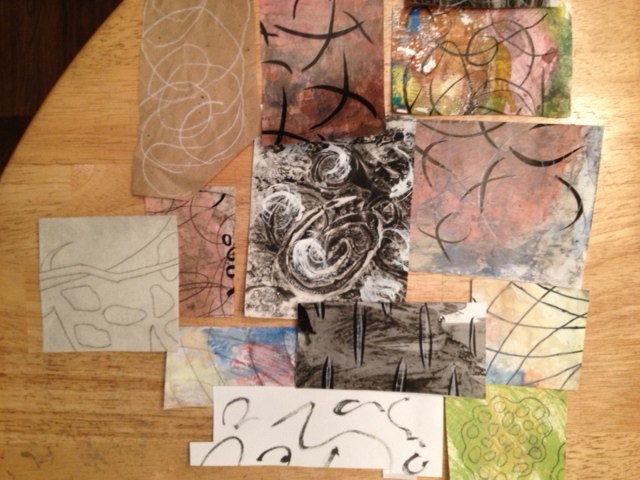 The one sticking out at the bottom left is a piece of an old artist’s proof of one of my etchings. One of a kind, so I’m going to be very selective with that one. I’m enjoying the variety and visual stimulation that I get just leafing through all these fun papers. It’s fun to see your basket of papers. What a good idea to use a deep laundry basket to corral it all. My daily collage boxes are too short when I start pawing through them. Well, to be fair, Jo — the big basket isn’t all that big. It’s the size we get from the fruit stand when we buy peaches and is 8×12″ and 4″ deep. But even so, a laundry basket would definitely work! what a great play on colour and line. That basket has a lot of goodies in it, great idea too. Thanks, Bren! I’m glad you like my basket idea. Sometimes the simple things work best. I didn’t mention that I need a lap surface to work on, but I do, of course. So I keep a small-ish piece of foam board around for that purpose.